In just 80 minutes, you can treat yourself to an overview of the fundamentals of case construction in Build a Frame-and-Panel Cabinet. 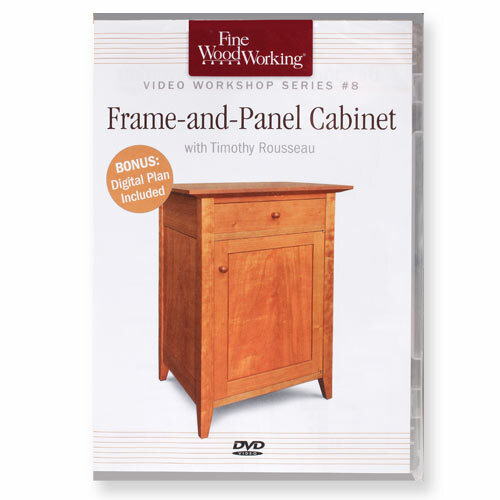 Furniture maker and woodworking instructor Tim Rousseau walks you through every step of the process, from rough board to final cabinet in this DVD, which includes a Bonus SketchUp Plan. As Tim demonstrates, this one-door, one-drawer piece is the best vehicle for teaching all the fundamentals. It involves mastery of a variety of unique joinery techniques. The external frame is secured with basic mortise-and-tenon joints but, as you'll see, there's more to the internal frame than meets the eye - and that includes using connectors called blades. You'll learn how to make a frame-and-panel door that fits precisely into its opening, an efficient way to install knife hinges, and techniques for shaping tapered legs. Discover expert tips for installing a drawer that slides like a piston, so every drawer you build going forward will work just as smoothly. This how-to episode offers intermediate woodworkers an invaluable opportunity to master the essentials of constructing quality casework. From initial design and plans to finishing and hardware, it's all here. 80 min.